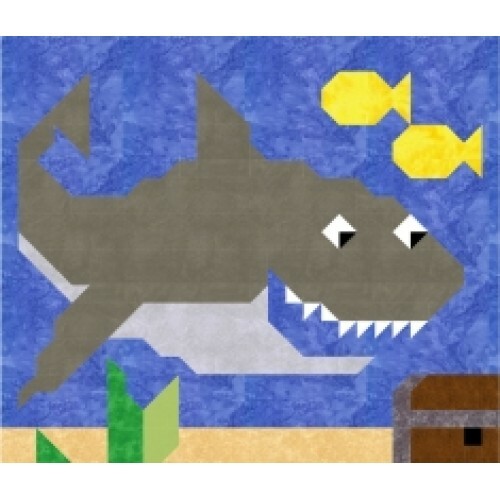 The shark started a little backwords with a custom Twin pattern, then a matching pillowcae, and now the traditional 3 size quilt pattern. All sharks with a toothy mouth full of fun. A great pattern for beginning quilters, instructions include: fabric yardage, cutting instructions, triangle tips, sewing instructions, and basic finishing instruction. The pattern first uses a chart with the given number of strips to be cut for each color. Second, it has a set of charts with piece lengths to be cut from those strips and labeled. Next you sew straight 1/4 inch seams following a full page labeled picture of the quilt top. The shaping is done with quick corner triangles, or the “snowball method” where a sew line is drawn corner to corner on a square and place on top of another square or rectangle. Once the payment has been processed you can download your patterns by going to My Account > Downloads. The pattern is a 6 page color pattern and its cover in PDF format files.